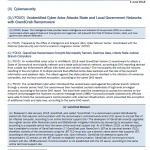 An unidentified cyber actor in mid-March 2018 used GrandCrab Version 2 ransomware to attack a State of Connecticut municipality network and a state judicial branch network, according to DHS reporting derived from a state law enforcement official with direct and indirect access. The municipality did not pay the ransom, resulting in the encryption of multiple servers that affected some data backups and the loss of tax payment information and assessor data. The attack against the state judicial branch resulted in the infection of numerous computers, but minimal content encryption, according to the same DHS report. The healthcare sector has been a desirable target for hackers due to the sensitive nature of patient information contained in their systems. The stakes are very high in the healthcare industry because any disruption in operations and care can have significant repercussions for patients. 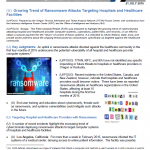 As such, this industry offers an ideal victim for ransomware, and these attacks are likely to continue—disrupting employee access to important documents and patient data and hampering the ability to provide critical services—creating a public safety concern. 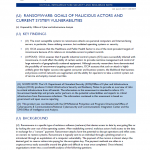 The ‘Locky’ malware is a ransomware variant, which has extensively utilized spam campaigns to distribute malicious files that download and execute code capable of encrypting numerous critical file types on both local and networked file stores. Encrypted files are renamed with a unique hexadecimal filename and receive the “.locky” extension. Each directory containing encrypted files contains instructions on how to utilize Bitcoin in order to pay a ransom for file recovery, and the system’s computer background is also changed to contain payment instructions. Recovery of encrypted files is impossible without data backup or acquisition of the private key due to the well-implemented, strong encryption. 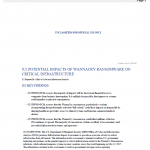 Historically, while payment of the ransom may result in receipt of the valid private key, enabling decryption of the targeted files, the FBI does not recommended the victim pay the ransom. 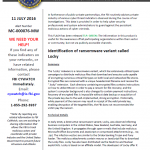 The Department of Homeland Security National Cybersecurity and Communications Integration Center (NCCIC) has notified the Department of Health and Human Services (HHS) of an increase in ransomware incidents at some healthcare organizations in the U.S. 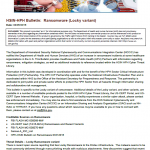 This Bulletin provides Healthcare and Public Health (HPH) Partners with information regarding ransomware, mitigation strategies, as well as additional materials to reference located within the HSIN HPH Cyber Threat Library. The FBI previously identified that the actor(s) exploit Java-based Web servers to gain persistent access to a victim network and infect Windows-based hosts. 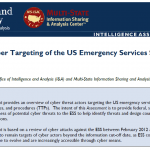 The FBI also indicated that several victims have reported the initial intrusion occurred via JBOSS applications. Further analysis of victim machines indicates that, in at least two cases, the attackers used a Python tool, known as JexBoss, to probe and exploit target systems. Analysis of the JexBoss Exploit Kit identified the specific JBoss services targeted and vulnerabilities exploited. 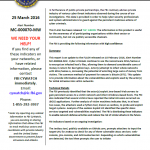 The FBI is distributing these indicators to enable network defense activities and reduce the risk of similar attacks in the future.